Quick Creamy Penne Caper Chicken (serves 4-6) | Crappy Kitchen - Good Dinners! This is comfort food at its best and exactly what I was in the mood for the last night. I know that when people see the word “creamy” in a recipe it tends to make them turn the page quickly for fear that even looking at the word will make them gain weight. From my experience in the kitchen, and living around people for quite some time, I know that eating a dish like this once in a while is not the culprit. It is all that other stuff we do, like eating bigger portions than we should, drinking sugar-loaded beverages and diving into that bag of chips with a little too much gusto! Because of this, we deprive ourselves of a great dish like the one I cooked for myself and my family last night. I didn’t feel a shred of guilt as I glugged the cream into the pan and nor should you. I know that if you are on a mission to loose some weight it might be something to avoid for the moment (however read this if you want to know what I think about dieting! ), but as a general rule, dishes like this shouldn’t be tabu unless you are over-indulging in the wrong foods, or it is a medical issue. So go ahead and try this great pasta dish out, without guilt or remorse. Besides your worry about the cream, the rest of the ingredients should make you feel great: chicken breast, spinach, onions, garlic, celery! 1 – Season chicken lightly with salt, pepper and cayenne pepper flakes (if you are using). Put large saute pan (big enough to hold the entire completed dish) on high heat and add the oil. When it is hot, add the chicken and cook undisturbed for 3 or so minutes until browned. Turn meat and lower heat to medium and cook for another 3 minutes. Remove from pan to a plate and tent loosely with foil. After about 10 minutes (in the meantime you can be getting on with the rest of the dish) cut each chicken breast into 1/4 inch slices (about 1/2 cm). Cover and set aside. 2 – If the pan looks dry, add a little oil and add the celery, onions and garlic. Cook for 5 to 6 minutes until vegetables become softer., stirring occasionally. 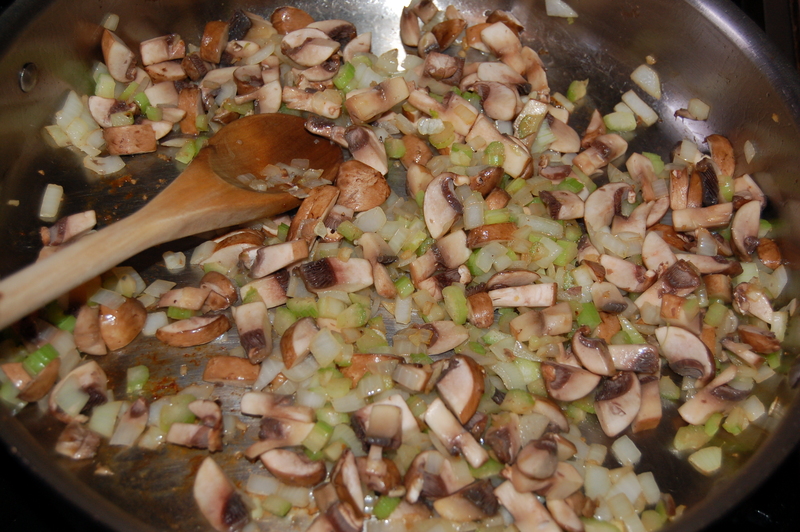 3 – Add the thyme and diced mushrooms and continue to cook for another 5 or 6 minutes, until the mushrooms start to brown and begin releasing juices. 4 – Add the chopped spinach and capers and cook for 1 minute before adding the broth (or bouillon and water). Turn up heat slightly and stir to release any brown bits stuck to the bottom of your pan. Add the cream and bring to a low boil. 5 – When it just begins to boil add the sliced chicken, along with the accumulated juices and turn heat down to low. Cover and cook at a very low simmer for about 5 to 7 minutes or until the chicken is completely cooked (you can check by cutting into a piece. The meat should be tender, juicy and white). Turn pan off and immediately add the cooked, drained pasta. Gently stir everything together and add a little pasta cooking water if you want a looser sauce. Taste and adjust seasoning if necessary. Serve in warmed shallow bowls and pass a little grate Parmigiano Reggiano and extra pepper flakes if you so desire! This entry was posted in dinners and tagged caper chicken, comfort food, creamy chicken, creamy sauce, creamy spinach, diets, heavy cream, penne chicken, penne dinner, quick dinner. Bookmark the permalink.